Sidebar is fully responsive and suits any screen size, so that every visitor enjoys a great user experience and beautiful design of your website. Designed with search engine in mind to get you indexed and ranking high in all search results. Sidebar is compatible with WPML. This allows you to conveniently customize and manage your website no matter what language you speak. Enjoy regular updates and the assurance that your site will always be compatible with the latest version of WordPress. 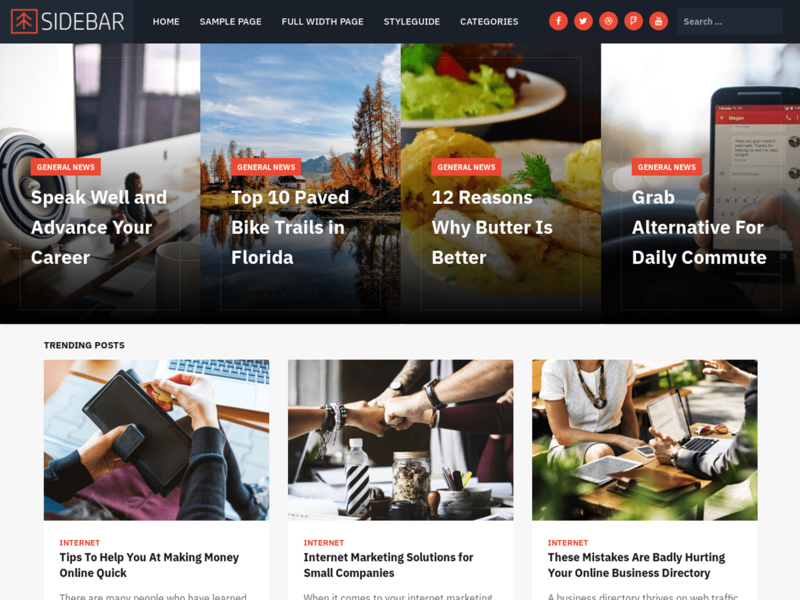 Sidebar comes with a custom homepage template which packs four different type of content cards to show your content with major highlight on the image. Sidebar is based on Twitter Bootstrap framework and has Theme options to manage general settings like Logo, Favicon, Social Media links etc. We have also focused highly on the single post layout which has your featured image front and center with large typography for post titles. © 2018 MetricThemes. All Rights Reserved.